As many readers may agree, novel raw materials are the main path to innovations in coatings and inks. You may also share my view that the sustainability (short-term, medium-term and long term) of coatings and inks industries relies on novel raw materials, and he who possesses the ability to invent new, alternative raw materials holds the key to success in future coatings and inks industries in an increasingly environmentally conscious society. With application benefits for polyesters and resins, bio-based succinic acid can drive sustainability and address customer demand for high-performance coatings. Modern coatings continue to meet the basic aesthetic requirements and increased resistance to external influences demanded by the customer. However, as reserves of fossil fuels decline, the coatings industry must look to the future − despite today’s competitive oil prices − and aim to avoid raw material shortages. CHINACOAT2018 (The 23rd China International Exhibition for Coatings, Printing Inks and Adhesives), closed its gate on Dec 6 at Area A of the China Import and Export Fair Complex in Guangzhou, P. R. China. The global coatings show reported good results again this year with the continued support from the industry. The former AkzoNobel Specialty Chemicals was relaunched as Nouryon last October. Nouryon’s new company mission is - Your partner in essential chemistry for a sustainable future. CCJ was honoured to have an interview with Mr. Paul Eason, Global Business Director for Paints, Performance Additives, Nouryon during CHINACOAT2018 Guangzhou last December to understand the development direction of the new company. Founded in 2002, Nanjing Tianshi focuses on the development and application of micronised wax to provide customized solutions. CCJ took this opportunity to have an interview with Mr. Xu Le, Sales Director of Nanjing Tianshi New Materials Technology Co., Ltd. during CHINACOAT2018 Guangzhou in last December to learn the company’s debut of Tianshi Landun fungicide products. Interest in matt-painted cars ebbs and flows like the tide. In this context, matt paintwork is more often than not sold as a design innovation that attracts little purchase interest – with correspondingly minuscule sales figures. The slightest interest in matt-painted cars surely stems from psychological and practical aspects. People have always valued anything that shines. Shiny denotes fresh and clean. Matt, on the other hand, evokes a used and worn impression, with a hint of mysterious too. 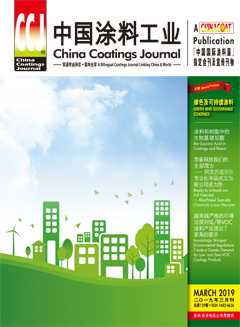 In the last issue, we mentioned there is a need to develop a simpler technology, not requiring surface preactivation of polymeric substrate by flame treatment, whilst simultaneously providing high surface conductivity and good coating adhesion to the surface of coated and originally non-conductive products to facilitate adoption of this highly efficient electrostatic powder coating or, where relevant, electrostatically-assisted wet painting for the reduction or eradication of hazardous solid wastes, waste of water and VOC emissions.